After having seen Dawn of the Dead about ten different times, the prospect of watching it yet again filled me with the kind of dread I usually reserve for when I’m watching those Paul Naschy movies where he turns into a werewolf and is thus forced to run around shirtless. There is no denying that in its original and various extended cuts, this movie is simply too long. Despite its length though, there was still a movie in all that padding that I fell in love with and I wasn’t ready to ditch it just because of a few love handles. So how did I attempt to revive my flagging relationship with David Emge’s most famous film? I turned to Dario Argento of course. Argento was one of the producers of the film and retained the rights to distribute it in Europe. He also retained the ability to chop up the movie to his liking. This resulted in him releasing a version in Europe that was shorter than Romero’s version and substantially rescored. Basically, what Argento did with the movie was strip out most of the junk that served to slow things up. 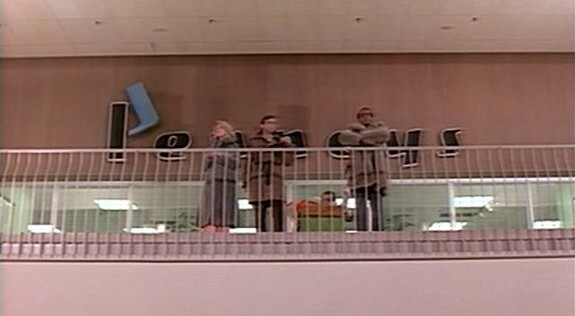 The main thing I noticed was that the interminable scenes in the mall where our heroes go on a shopping spree are shortened up which helps things out since the middle of this movie was always a saggy mass in serious need of an Ab Roller. There’s some other scenes that were missing, but nothing that really matters in the grand scheme of things. Argento’s apparent intent was to turn this into a movie where mayhem can transpire uninterrupted by anything but the most perfunctory of interludes. 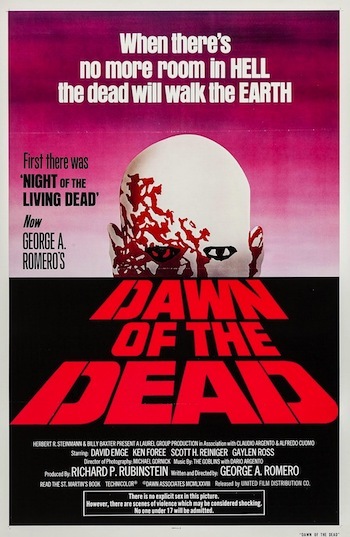 Some may see this as a dumbing down of Romero’s alleged commentary on our mass market consumer culture, but I prefer to see it as a jacking up of Romero’s somewhat sluggish zombie proto-Die Hard flick. Fran is working at a TV station and her boyfriend Stephen is a helicopter pilot. They decide to escape the zombie epidemic while they still can, but showing us the same kind of planning that resulted in Stephen getting her knocked up even though they aren’t married, their escape plan pretty much just involves them getting in a helicopter and flying away. The rest of it will apparently be worked out in the air. 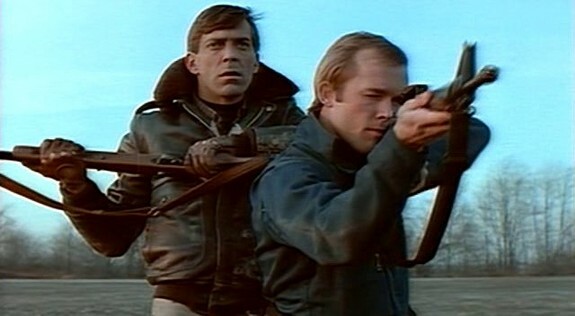 Along the way, they pick up two SWAT team guys who have just been in a firefight with a building full of zombies. There’s the cool and collected Peter and the little spaz named Roger. 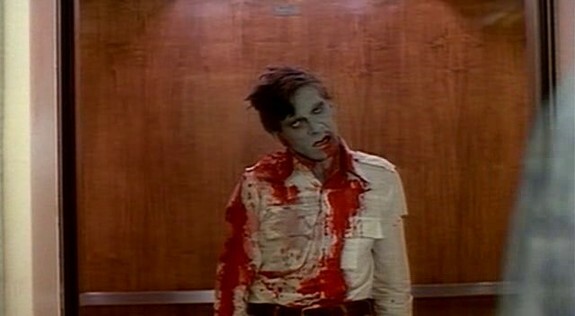 Roger’s spastic nature would eventually be his downfall as he gets all bit up by a zombie during a rather stupid scene involving he and Peter braving a bunch of zombies to go and retrieve his bag that he dropped outside the mall. If you have an entire mall at your disposal, what could be in that bag that you would be risking your life to get? And what was the usually smart Peter thinking when he let Roger go back and get the bag? Oh well, that scene involved some semis running over zombies, so I didn’t really dwell on the pointlessness of that particular plot twist. These four fly around in their helicopter and end up at a mall. I’ve always found the most bizarre moment in the movie to be when they first spot the mall and some character asks what it is and Stephen says it’s a shopping mall and then explains what a shopping mall was! You know, it’s an enclosed shopping area. What? Where was that guy from? Ghana? Once in the mall, the movie is basically a bunch of scenes where the characters run around avoiding zombies and collecting stuff to live off of. Into this paradise of free video games at the mall’s arcade comes a marauding band of bikers! This also causes all the zombies that have been milling around the outside of the mall to come in and turns into a battle between them and the bikers. For awhile the bikers have their way with the zombies, but are forced to retreat once Peter and Stephen start shooting the bikers and the zombies begin to get the upper hand in all the chaos. Other than being faster paced, the other thing you’ll notice about Argento’s version is the music. He’s added a bunch of Goblin and heavy metal, guitar oriented stuff to a lot of the scenes and the movie really benefits from it. Right from the beginning, the pulsing music sets an atmosphere of not only dread, but also one of anxiousness and a sense of urgency. If you were a fan of this movie and are looking for a slightly fresh take on it, you should try and find this version. If you haven’t seen the movie before, I’d also suggest this version since I don’t think you’d be missing out on anything important from Romero’s version. Well, you’d be missing out on some boring stuff as well as some attempts at humor, but if you have a day and a half to spare to watch it all, more power to you.